Tom Horn, Betsoft and Yggdrasil have continued their European expansion plans thanks to new content deals. Most of these deals are gaming content only deals, but companies like Yggdrasil always have their software offerings in their back pocket as a high value up sell to operators. This year the markets remain challenging due to regulatory issues, but these three players have managed to capitalise on each and every licensing opportunity. Tom Horn has signed a new deal with Aspire Global to provide them with their full suite of Tom Horn pokie games. This gives Tom Horn another foot in the door in markets as diverse as the UK, Italy, Belgium, Portugal and Denmark. As Aspire Global COO Dima Reiderman stated, the company is always looking for fresh titles that offer their players something different. Tom Horn’s CEO Ondrej Lapides said that the company has been looking to hit 2018 running and they have done exactly that with this new content deal. Betsoft has announced new content deals that will see the developer get access to the Italian market. Snaitech is a relatively unknown name for many slot fans. They run a bevy of Italian online gaming services and with Betsoft joining their offerings their games library will receive a premium boost. The deal will include BetSoft gaming content along with their exclusive SHIFT platform games. Betsoft’s Francesca Raniolo said that they have been waiting for Snaitech to complete their omni channel offering project and now that the company is finally set to serve the Italian I-Gaming market, it has chosen one of the finest pokie developers available. Alessandro Allara from Snaitech stated that even though they already offer Italian players a substantial library of real money casino games, there will always be room for more Betsoft games as they have such high quality features and design elements. Yggdrasil has once again signed a content deal with long time partner GVC. They will enter the competitive Spanish market in the second quarter 2018. This country has recently published their I-gaming financials for last year and it looks incredibly promising. 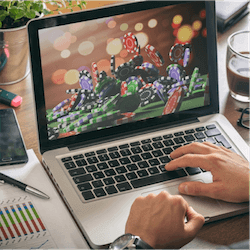 In a very similar way Portugal has also seen their I-gaming revenues rise, despite the teething problems of 2017 being their first legal year of running online casino gaming. This deal offers Yggdrasil exclusive access into this new market.